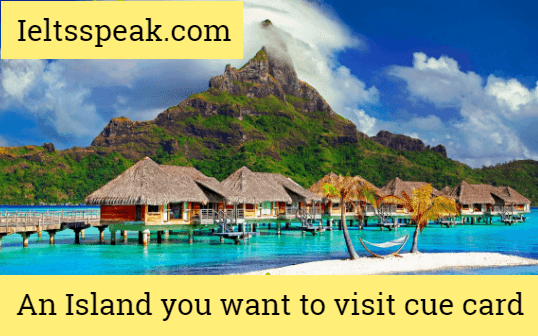 An Island you would Like to visit IELTS cue card- This is the cue card in the series of latest ielts speaking exam. You must try to speak this topic for more than 2 minutes. There is an unending list of places which I want to visit at least once in my lifetime. Among them are some beautiful islands. Although there are a number of islands that I know and wish to see, The little Andaman Island is my best-loved Island. This is because I was Spellbound when I, for the first time, saw the stunning images of this place. It was my friend who along with his family members went there and enjoyed his summer vacations in this cold temperate region. It is the fourth largest of the Andaman islands of India with a very small area, lying at the southern end of the archipelago. It is a part of Indian Union Territory of Andaman and Nicobar Islands. It has been one of the most popular holiday destinations in the world for the past few decades as sightseeing opportunities in this place are virtually endless. Although this place is famous for a great collection of endearingly popular beaches, the list of inland tourist attractions here goes far beyond just beautiful beaches. The exotic temples and palaces set against stunning natural backdrops are some of its eminent attractions. Another factor that applies me to see this place is my inclination to know the history as much as possible. And this place is densely dotted with a multitude of ancient establishments and historical sites. Furthermore, as I am a food lover, this place is well known for delicious and quite affordable food. Dining here presents endless choices of local cuisines that are famous across the world. Apart from this, there are numerous world-class diving spots with calm bays. I just wish to submerge myself in a thriving and vibrant underwater world. Last but not least there are many more off the beaten track spots around this magical island that are worth visiting. Can you describe something about islands? Have you toured an island in your past life? Which island did you go in your prior life? Do you like exploring different areas? Have you seen the pictures of Andaman Island? Is this island is your favourite place?